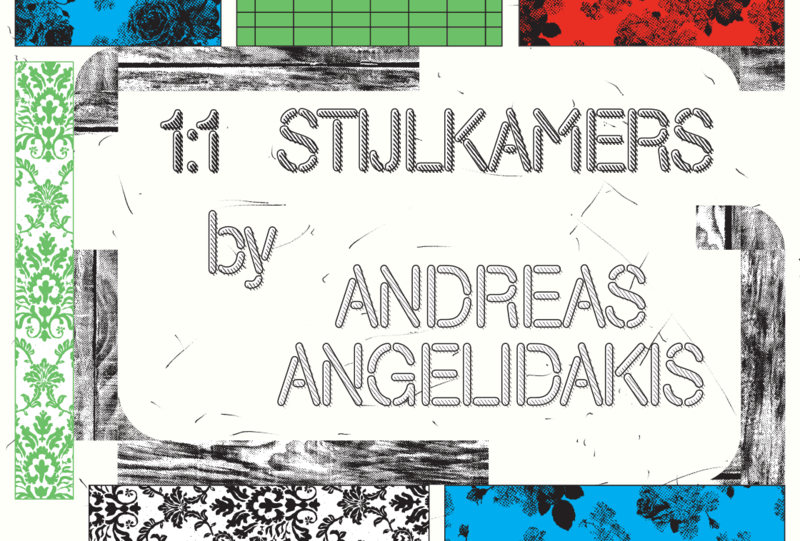 For 1:1 Period Rooms Andreas Angelidakis designed an installation with period rooms from Amsterdam Museum's collection. These period rooms originally hailed from the Stedelijk Museum, where they were replaced at the end of the 1970s by the modern art collection. Many Dutch museums were originally housed in buildings where the collection was exhibited in reconstructed historic interiors, so-called period rooms. The concept of the ‘period room’ (Stijlkamer in the Dutch) developed in the the great foreign museums in the course of the 19th century. Dutch period rooms hailed from residential properties that had been replaced with modern urban developments, although some ensembles were put together based on images from old paintings or prints. These interiors were presented as typological examples of national culture in the home setting, and it was in this setting that art collections and historical collections from across the land as well as from provincial capitals were shown to the public. The same was true of Amsterdam, where, at the end of the 19th century the Stedelijk (municipal) Museum was built with the patronage of Mrs Lopez Sasso-de Bruyn, who bequeathed her estate and collection to the city. The museum for contemporary art’s founders strove to acquire a series of Amsterdam interiors that were set to be demolished as part of urban renewal plans. These historic interiors served as the livery of the rooms in which the Lopez Suasso collection was put on show. 1906 saw the publication in the Stedelijk Museum of aGids voor bezoekers van de Sophia Augusta-Stichting (guide for visitors of the Sophia Augusta Foundation) in which each room was described separately. When Willem Sandberg became director of the Stedeljk Museum he took it upon himself to remove the ‘Suasso period rooms’ from the museum to make way for the modern art collection. Sandberg wanted to give the period rooms a new home in the Willet-Holthuysen Museum, or in an new building on Amstelstraat. It proved a difficult task and it was not until the 1970s that the period rooms were finally dismantled. Only a few fragments found their way to the Willet-Holthuysen Museum and the new wing with an overview of Amsterdam period rooms failed to make it beyond the drawing board of a series of different architects. Part of the 1:1 Period Rooms was the Empire Room. This 19th-century period room was constructed and then dismantled again live during the exhibition, in partnership with the University of Amsterdam and Amsterdam Museum. The latter maintained a blog to document and share the whole process. Wealthy merchant Rudolph Hendrik Pörtener (1737-1807) gave the order to have a 17th-century house on Keizersgracht rebuilt in 1802. City architect Abraham van der Hart (1747-1820) designed the reception room. This period saw the rise in popularity of the Empire style, named after Empiror Louis Napoleon. However, the then ageing Van der Hart chose not to adopt this style, preferring one more in kin with the English designs of Robert Adam. A common technique of the day was imitating marble. This interior has red painted pilasters, so-called marble, with white Corinthian capitals. They form a stark contrast with the yellow wainscoting. The mantelpiece is made of red and white marble and has Greek ornaments. Above it is a rectangular mirror decorated on both sides with woodcarving in leaf and vase patterns. The wall next to the window features a trumeau with the same frame decoration as the mantelpiece mirror. Above it hangs a painting with two putti carrying a beehive. Both the double doors and the ceiling are decorated with almond shapes and umbrella motifs. The building had to make way for the construction of Raadhuisstraat. The interior was then transported to the Stedelijk Museum, where it then became known as the Empire Room. Since the boarding was lower than the museum room itself, the pilasters were lengthened. Amsterdam Museum’s collection contains a painting by J. Berg from 1871 which portrays the interior. In some places the room in the Stedelijk Museum differs to the image in the painting. For example, the painting does not feature an architrave and frieze. These may have been later additions made in the museum to make it fit the space. The room in the painting also appears narrower and it is possible that the room was widened in a later stage. Alternatively, the artist may have painted the room inaccurately. More information on the historic interiors can be found on Amsterdam Museum’s website 'Interieurs: Collectie historische interieurs'. Director David Roëll introduced an important policy change at the Stedelijk Museum in late 1937. With Willem Sandberg as newly appointed conservator, emphasis shifted emphatically to modern art. Sandberg made a number of sweeping changes at the museum in 1938. He had the walls in the hall painted white and stretched a large, decorated canvas beneath the central glazed roof. In April of that year, he and architect Mart Stam organised the exhibition Abstract Art, which presented avant-garde art against a white background, marking an important moment in art history. The white walls and the way artworks were arranged were highly uncommon at that time. After the war, Sandberg was appointed director and continued to modernise the museum. No longer were the museum’s period rooms considered appropriate. Soon after Sandberg’s appointment, plans were drawn up to give these rooms a new purpose. Although he continued to experiment with exhibition techniques during this period, the pioneering white wall became a new standard at the museum. Slowly but surely, historicising interiors at the Stedelijk Museum made way for neutral, white exhibition galleries, which have dominated museums of art ever since. This project is part of the programme track Landscape and Interior and the folder Interior triptych in annual instalments. 1:1 Period Rooms is one instalment in a triptych devoted to interiors. Het Nieuwe Instituut previously presented the exhibition 1:1 Sets for Erwin Olaf & Bekleidung. These will be followed in 2016 by an exhibition devoted to the showroom.